A mid-year tuition increase for students is not out of the question if Pennsylvania fails to fund its state-related universities, Chancellor Patrick Gallagher said Tuesday. In a recent interview with the Pittsburgh Post-Gazette, the chancellor expressed his concerns that nearly $600 million in funding for Pennsylvania’s four state-related universities has not been secured. While this is not a new concern for the chancellor — who has even sent out an email to the university community regarding this issue — University spokesperson Joe Miksch confirmed Gallagher is considering a mid-year tuition increase if it comes to that point. In an statement to the Pitt community Thursday morning, Gallagher said the Board of Trustees approved budget and tuition for this year was based on Pitt getting full state funding. The funding is in jeopardy, he said, because no state revenue plan is in place. The state passed a $32 billion budget over the summer, but revenue legislation to fund and balance the budget is at a standstill. “State funds enable us to lower the cost of in-state tuition by about $11,000 per student,” Gallagher said. “Without this support, thousands of students from Pennsylvania would see tuition rates rise at Pitt and other flagship institutions. Funding for state-related institutions was uncertain in past years when the appropriations bills funding the universities weren’t passed on time. But this year, the situation is even more perilous — Pennsylvania faces a $2 billion deficit and the appropriations bills still haven’t been passed. Even if Gov. Tom Wolf borrows more than $1 billion, as he has promised, Gallagher is worried the fate of spending bills to fund the four state-related universities — Pitt, Penn State University, Temple University and Lincoln Memorial University — will remain uncertain. While there does not seem to be active opposition from Pennsylvania legislators to fund state-related universities at this time, state-related funding is essentially frozen until additional means of gaining revenue are passed by the state congress. Miksch said Pitt has received state funding for more than 50 years, and the state funding that the University stands to lose this year — $147 million — directly supports reduced tuition rates for in-state students. According to Miksch, a lack of action regarding state funding will impact thousands of students, faculty and staff. But the University has its own initiatives to lobby the state to secure funding for state-related universities. The Chancellor sent a campus-wide email to faculty, staff and students urging people to contact leaders in the Pennsylvania House of Representatives in early September. Text within the email linked to the with Pitt portal, a website created by the University that includes ways to contact state lawmakers and information about Pitt’s impact on Pennsylvania and its economy. Students are also involving themselves in lobbying efforts as well. Pitt’s Student Government Board kicked off a phone banking initiative Wednesday to push for funding. 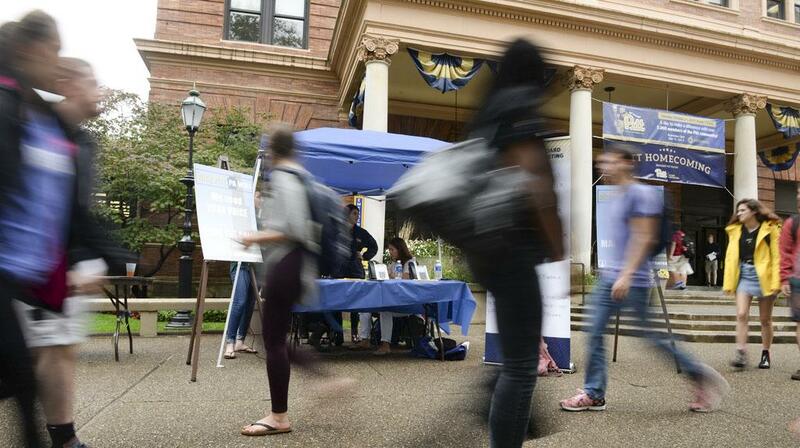 The event — held from 11 a.m. to 1 p.m. outside the William Pitt Union — offered a free slice of pizza to anyone who called a state representative and read a prepared prompt. With about 10 minutes to go in Wednesday’s phone banking event, Jessica Chong, the chair of the community and governmental relations committee for SGB, said roughly 90 people had already made calls. Chong said pushing legislators to pass a revenue package to fund state-related universities is important to prevent rising tuition rates for in-state students. SGB will phone bank again Thursday and Friday of this week from 11 a.m. to 1 p.m.
As part of the campaign, SGB is also encouraging people to use two hashtags — #keepPittpublic and #withPittPAwins. Without state funding, Gallagher said the University would effectively become private, which would shift the University’s focus more toward national recruitment and branding. This new focus would alter the composition of Pitt’s student body, he said in the Post-Gazette article. Katelin McLaughlin, a sophomore political science major and in-state student, was one student that participated in SGB’s phone banking event. She said the cause motivated her more than the pizza.